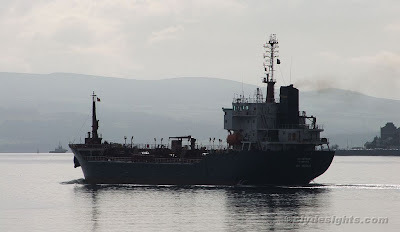 RUDDERMAN, a tanker owned by James Fisher Everard, arrived shortly after SPIRIT OF ADVENTURE with a cargo of fuel for Rothesay Dock, wehich she had loaded at Eastham. As she headed for the river channel, the tug SVITZER MILFORD awaited her arrival at No 1 Buoy. RUDDERMAN was buil in Malaya in 1994, and is 6,418 tonnes deadweight.